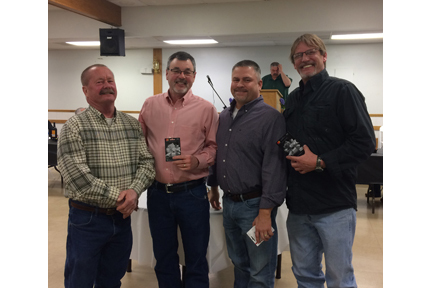 The New Melle Fire Department held their annual awards and appreciation banquet April 7, 2018, at New Melle Sports and Recreation. The guest speaker was Lisa (Drier) Key, Chief Development Officer at Emmaus, Inc. Key talked about volunteerism in communities and the history of volunteerism in relation to fire fighting. She said firefighters were among the first volunteers in our country. Ben Franklin founded one of the very first volunteer fire brigades in the U.S. in 1736. Today, more than 70% of our nation’s firefighters are volunteers. Key said one out of every four Americans volunteers in some way. Most volunteers are between the ages of 35 and 54. For every hour volunteered, the average economic value is over $24 (i.e. that’s what it would cost if you had to pay someone to do the job a volunteer is doing.) The total economic impact of volunteers across the U.S. annually is $1.85 Billion. Key talked about Emmaus, Inc. which provides services for developmentally disabled adults, and how volunteers have helped that organization over the years. Last year, Emmaus benefited from about 15,000 hours of volunteer activity, which amounted to about $500,000 in saved revenue. Based on her own personal encounters, Key commended firefighters for their professionalism, their ability to interact with people, bring comfort, and de-esculate stressful situations. She also thanked them for their generosity, not only in material things, but also in terms of time and dedication, to the communities they serve. “You are respected and appreciated,” she said. Shell also commented on the teamwork here, from the board to the chief to the firefighters to the auxiliary. “We get along pretty well and we’re very lucky to have a climate of cooperation,” he said. Among the accomplishments of the past year was an accounting review which resulted in some recommendations that have been implemented. The department has also ordered a new pumper truck, which will be delivered in November (and barring any unforeseen expenditures – the truck is expected to be paid for when it arrives – with a cost of about $881,000.) A new UTV and trailer were purchased in 2017, which have proven to be a great asset. New siding was added to Station 3 and a new roof on Station 2. The department responded to about 500 calls in 2017. About 50% are rescue/emergency medical for traffic crashes. About 10% are for fire. Shell said the staff continues to go beyond the call of duty to help do various tasks which save the district a lot of money. The NMFPD currently has 12 paid employees and several new volunteers. Chief Rick Massey thanked all the firefighters for their work and dedication, and the board for their support. Awards were announced for years of service and highest responses. John R. Schneider was recognized as the top volunteer responder in 2017, as well as having 10 years of service to the department. Stacey Gerard and Kevin Kloda were recognized for 5 years of service. Other top volunteer responders included Steve Elfrink, Kevin Kloda, Chris Bledsoe and Kevin Martin. To learn more about the New Melle Fire Protection District, you can visit www.newmellefire.org and follow them on FaceBook. To report an emergency, call 911. Non-emergency number: 636-828-5528. Kevin Martin (5th), Chris Bledsoe (4th), and Kevin Kloda (3rd). Not pictured: Steve Elfrink (2nd) and John Schneider (1st). 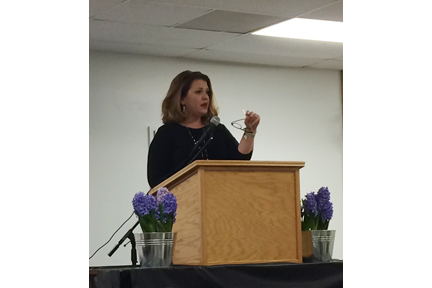 Lisa (Drier) Key- Chief Development Officer at Emmaus, Inc. was the guest speaker. impact they have on the communities they serve.